THERE was intense excitement in the newsroom of ITN. 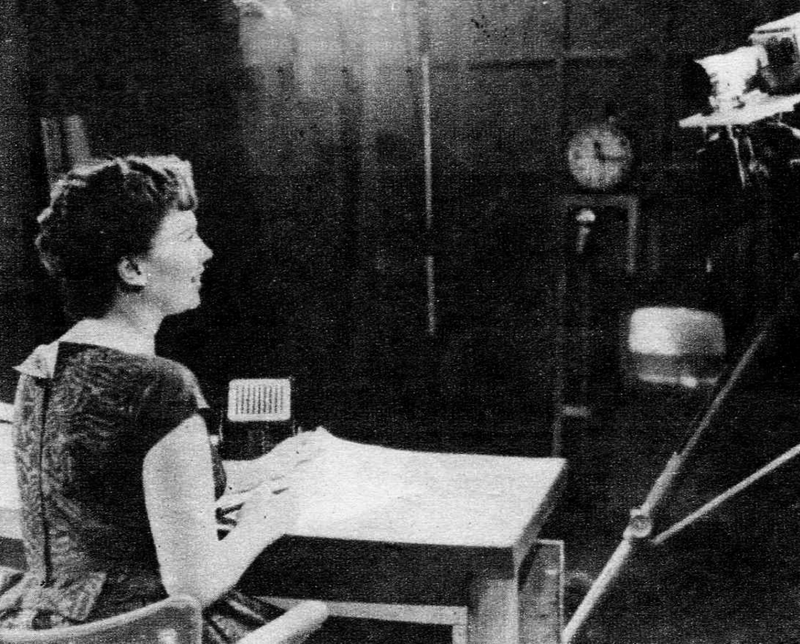 With the start of Independent Television only weeks away (Sept. 22, 1955), the tempo of training was becoming more and more frenzied. For weeks the news staff, still without news sources of their own. 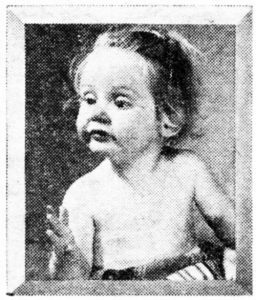 had been cutting out items from the evening papers, pasting them on to bits of paper and passing them over to Chris Chataway and Robin Day so that they could practise reading “dummy” news bulletins. But on this day the excitement was because a film of a prison break in America had just been flown in FROM New York. 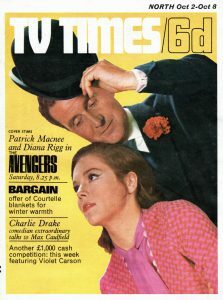 This meant that at last something not far removed from a real programme could be tried out. 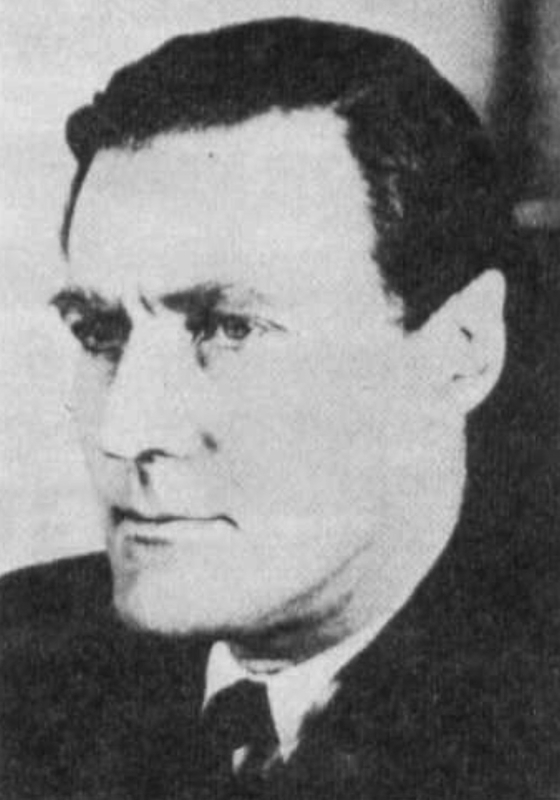 Robin Day took his seat at a table, facing directly into a closed-circuit TV camera. 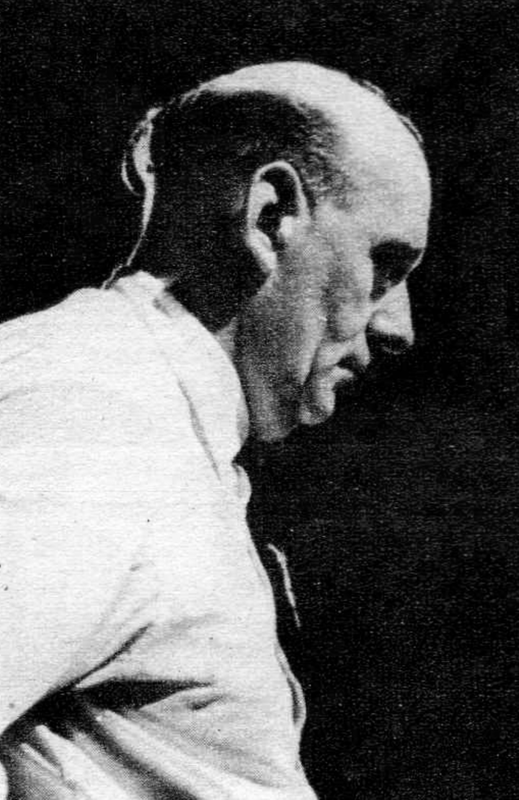 To one side of him, an operator prepared to project the American newsreel on to the wall of the ITN newsroom. Hovering around, his spectacles pushed up on his forehead like a First World War pilot with raised goggles, was Aidan Crawley, then editor-in-chief. Robin Day was cued-in by a producer. He read out two or three items, managing not to stumble at all, although he still couldn’t help plucking nervously at his bow-tie. Suddenly little matchstick figures could be seen jumping back and forward on the walk But there was no sound! Slowly but impressively ITV was gaining momentum; tackling and overcoming problem after problem; training its raw if enthusiastic staff, trying out its equipment — where it was fortunate enough to have any! The technicians lumbered off in a great big O.B. van, Everett himself following in his nippy sports car. 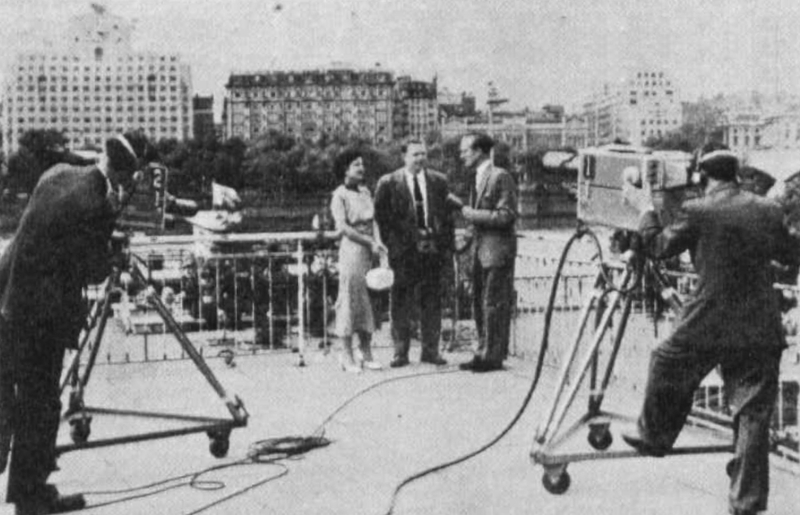 A camera was set up by the side of the Thames while “Sweetie Pye” and a monitor screen, packed inside an O.B. van, were parked outside the Festival Hall. At once, he telephoned Television House to tell the waiting Programmes Controller the good news. Then, for half an hour or so, the whole unit enjoyed itself, taking pictures of passing buses or river craft, mocking up a commentary as they went along. Yet enormous technical problems still remained to be overcome. At his office in Lower Regent Street, Commander E. N. Haines, in charge of technical installation for Rediffusion, scratched his head and wondered how to arrange a micro-wave link between the studios in Television House, Kingsway, the Granville Theatre and the various O.B. units operating in the held. The water tower (which figures prominently in G. K. Chesterton’s novel, “The Napoleon of Notting Hill”) stands 156ft. high on top of a considerable rise of ground in Kensington. Inside it was an enormous 10ft. pipe through which water used to be pumped to London. Could Haines get a micro-wave receiving dish up on to the top of it? Well, there was only one way to find out and that was to climb up and have a look. It proved to be a fantastic job. Haines, a retired D-Day assault commander, accompanied by an official from the Water Board, a man in his 60’s, clung precariously to a small iron ladder running up inside the tower and climbed up the 156ft. to the top. And three times they repeated this dizzy, frightening feat before they could be sure that the tower would prove perfect for the job. Then engineers cut a big hole in the bottom of the tower, removed the water pipe, bit by bit, and built up a staircase inside. Just under the top of the tower, they erected a small room into which they packed all the reception gear for a micro-wave link. Finally they hauled up a big dish and erected it on top of the tower so that it could be beamed all round London and could pick up O.B. units many miles away. 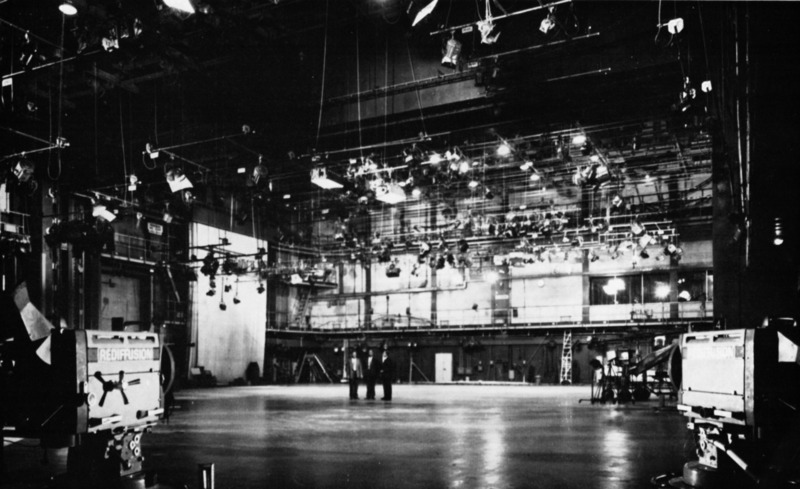 Although the men organising ITV were working 16 and 17 hours a day, they were getting a great deal of fun out of it all. One day Eric Linden, now Features Editor of TVTimes went along to an hotel to interview the American singer, Guy Mitchell, who was to star in the first of Val Parnell‘s Sunday Night at the London Palladium shows. When Mitchell had finished talking to reporters he asked Eric to stay behind for an extended chat. Then to Eric’s surprise — and the horror of the waiters — he pulled a portable barbecue from his baggage and started grilling a couple of steaks in the middle of the room! BUCKINGHAM PALACE is to get the new TV. The order has gone out that all sets at the Palace must be capable of receiving Independent Television programmes when the Queen and the Duke of Edinburgh return from their Balmoral holiday. The Royal family have always been keen viewers and now — at the turn of a switch — they will be able to see the star-studded, vigorous shows produced by the London programme contractors. And I hear of an interesting conversation the other day between the Duke of Edinburgh and Sir William Becher, M.C., Associated-Rediffusion’s cricket adviser. They were opposing cricketers in a charity match, but cricket was by no means the only topic discussed. The Duke proved to be intensely interested in Independent TV, quizzing Sir William for much information on the subject. At the Palace, Sandringham, and Windsor, the Queen makes a point of sitting with Prince Charles and Princess Anne to watch the children’s programmes. “Not that I would say a word behind her back-” Or what do you think the young gossip seems to be saying? Can you find a better title for this picture? Watch next Saturday’s “Week-end” programme. Eighty TV editors, from newspapers in all parts of America, have just flown home. They have been touring the British TV studios and are now reporting to their readers what they have seen. From the questions they have been asking in England, it seems that many people on the other side of the Atlantic are envious of our advertising plans. You see, in America, the advertisers sponsor the programmes themselves: for example, a soup manufacturer sets up a special department to produce plays for TV. But in England the programmes are completely independent — time is sold to advertisers rather like a newspaper sells space alongside the news. And that, think many in America, is a better idea than the “sponsoring” system. PRESS photographers at the filming of a “Noddy” programme urged that children should appear in the pictures with the puppet. 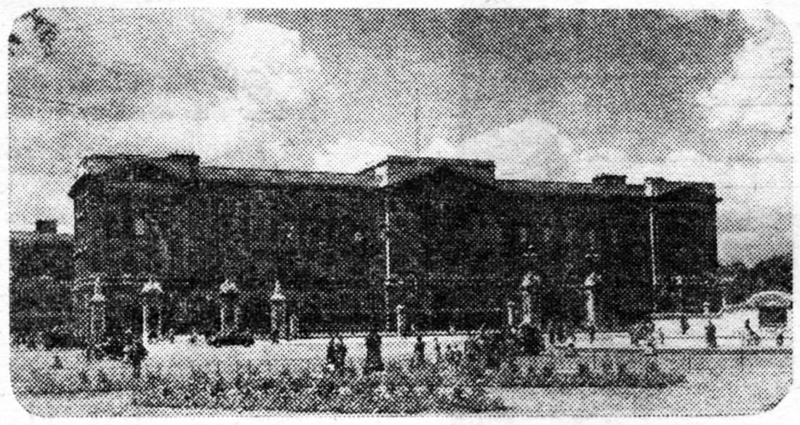 Duly Mrs. Lawrence arrived with “Tiny,” aged four and Christopher, aged five. They had the time of their lives posing with Noddy, their favourite story-book character. It was a very warm day and I wondered how “Ming” had managed to keep the children so clean and tidy. 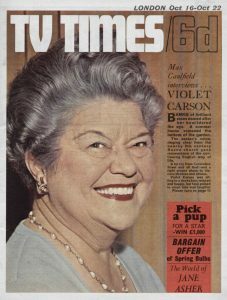 IF pretty Pat Fender, a commere of Morning Magazine, ever has a cricketer to interview she’ll be asking questions to which she already knows the answers. For dark-haired, 25-year-old Pat is the daughter of P. G. H. Fender, skipper of Surrey’s cricket XI for eleven years. She plays cricket occasionally herself, and helped to “put on the map” a women’s cricket team in New York last year when she was acting, announcing, and commentating for American TV. She is unmarried and lives with her parents in a little street behind Park Lane. Miss Fender has this confession to make: after giving the subject long and serious thought, she considers that cricket is NOT a woman’s game. WHAT a surprise for the great Dan Leno if he could see the Granville today. 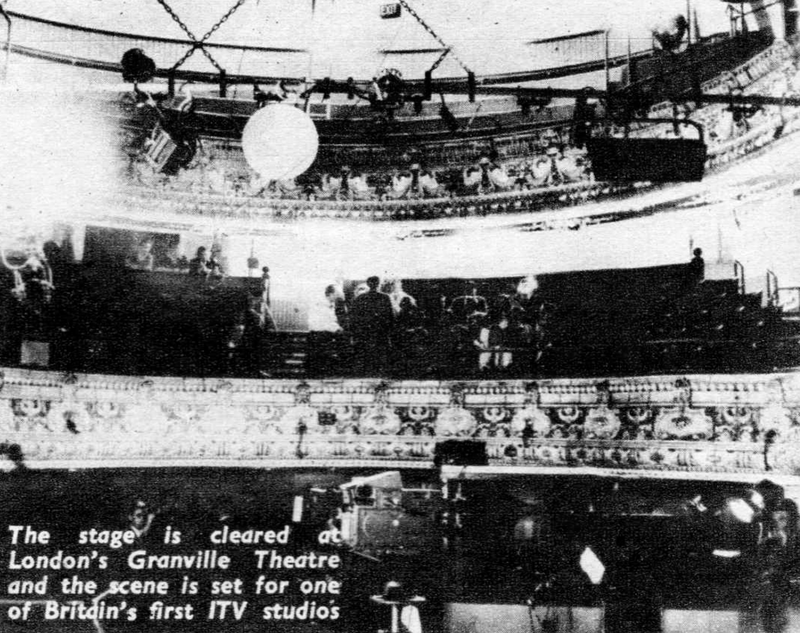 The Granville is the old music hall at Walham Green, London, which Leno helped to found and where he appeared regularly. 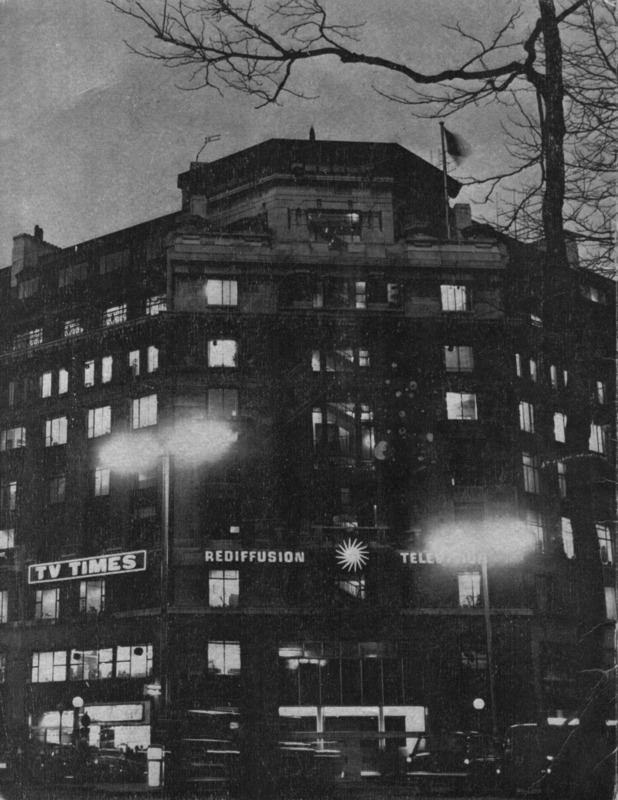 Now it has been bought by Associated-Rediffusion and converted into a modern television theatre. But the best has been retained. For example, the walls of beautifully painted tiles are still there. The flooring was ripped up, though. And under the carpeting one of the workmen found a golden guinea. NOSES are very important, and the nose of Orson Welles is no exception. He pays it great attention. OWING to rebuilding at Television House ABC’s “Week-end” programme has a temporary studio too small to contain a grand piano.